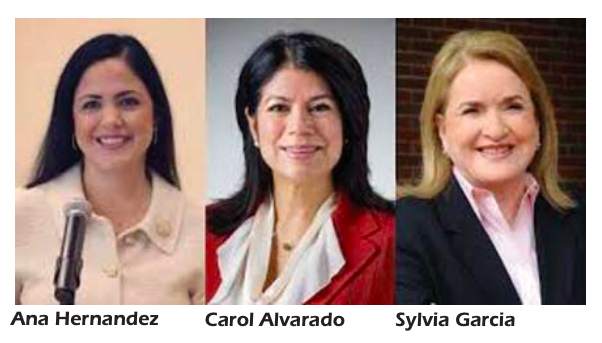 After Sylvia Garcia won a seat in the U.S. Congress in the Nov. 6 general election, she resigned from the Texas Senate District 6. She will now represent TX29 in Congress, Gene Green’s old seat. Ana Hernandez now represents District 143 in the Texas House. She is originally from Reynosa, raised in Pasadena, and was formerly an undocumented immigrant that earned her citizenship in 1986. She has been a State Representative since 2005. In the house, she has a record of bill passage rate nearly 50 percent greater than the average. She has championed bills that help families find good-paying jobs, crack down on human trafficking, and make neighborhoods safer and more secure. She campaigns for better funding for public schools, immigration reform, expanding healthcare for all, and better roads and infrastructure. She serves on the Committee on Judiciary and Civil Jurisprudence, Committee on Licensing & Administrative Procedures, and Committee on Redistricting. She has degrees from the University of Houston, and University of Texas. Ana is also a practicing attorney, with her own firm. She has won numerous awards for her work in the Legislature, and in volunteer work. Carol Alvarado now represents District 145 in the Texas House. She was elected to that position in 2008. Previously she was a member of Houston City Council. She is chairperson of the Texas House Committee on Urban Affairs. She is a member of the Higher Education Committee, and the Select Committee on Opioids and Substance Abuse. She campaigns for protection for so-called “Dreamers,” proper funding for public education, women’s reproductive health, and full recovery from Hurricane Harvey. As a legislator she has won numerous awards, including in 2015 the Texas Municipal Legislator of the Year. She holds two degrees from the University of Houston. Senate District 6 includes portions of Texas House Districts 143 and 145, so voters are familiar with these two candidates. The district is primarily Democratic, with a 74 percent Hispanic population, and 85 percent minority. When the Legislature reconvenes on January 8, 2019 it will have a new Senator from District 6.